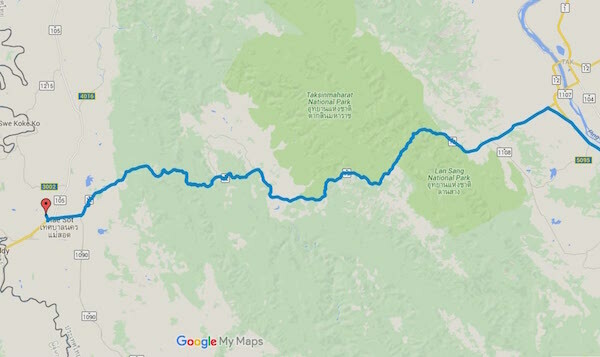 Day 4 – Ratchaburi to Mae Sot. 580km on the odometer. 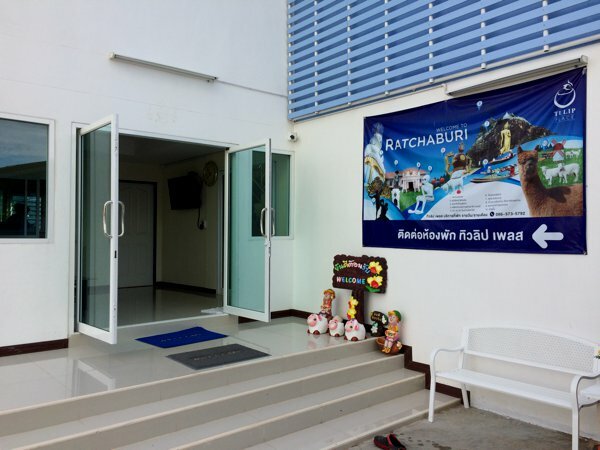 My accommodation in Ratchaburi was nice and clean, but it didn’t come with breakfast. Thankfully, I had that extra-large biscuit and 2 mangoes from the owner of the place I stayed in the night before. Oh! The mangoes were super sweet! And so after breakfast, I did some bike maintenance – the chain slack was too loose. Had it adjusted and also got my tires inflated. Lubed the chain, and I was ready to roll by 8am. 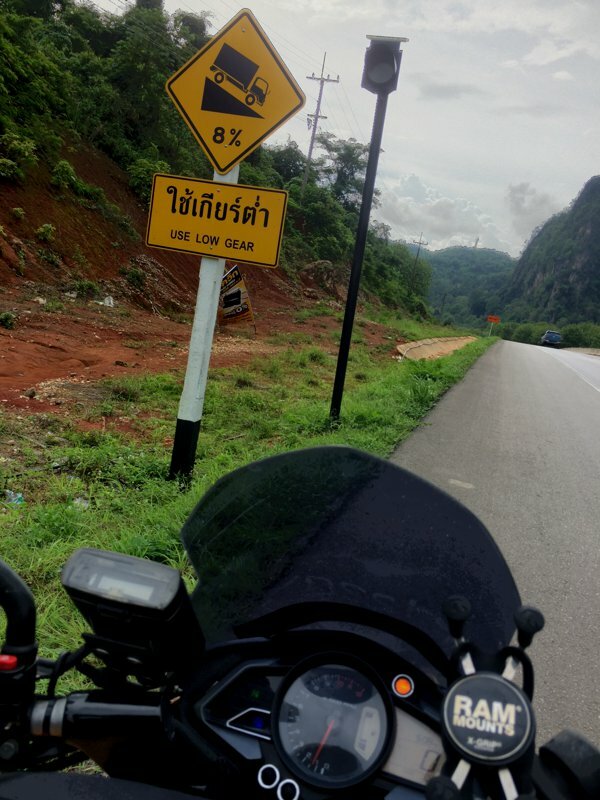 At the recommendation of the fellow Thai biker friend whom I met yesterday, I’m headed to Mae Sot today. 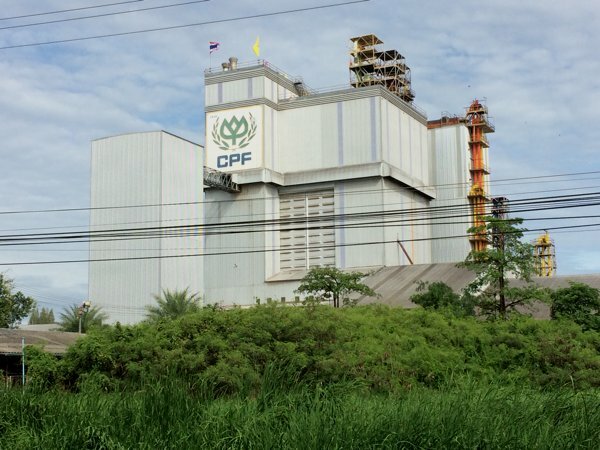 Only the Singaporeans can understand this – CPF Building somewhere in Thailand. I wonder what sort of interest rates they have on their accounts. 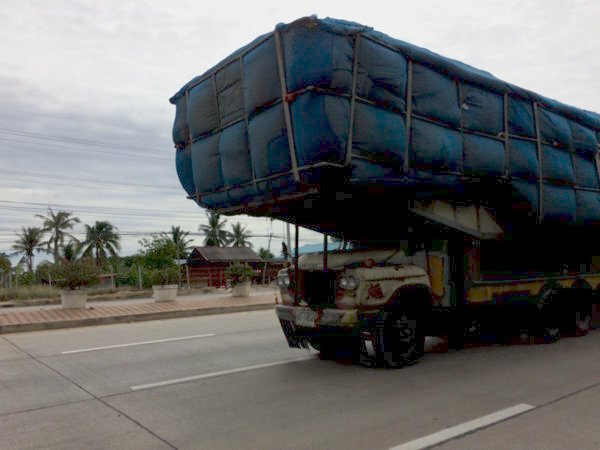 Extremely overloaded trucks like this are a common sight. Hmmm… This truck just reminds me of a military combat engineer’s mobile bridge. Quick lunch at one of those highway rest stops. 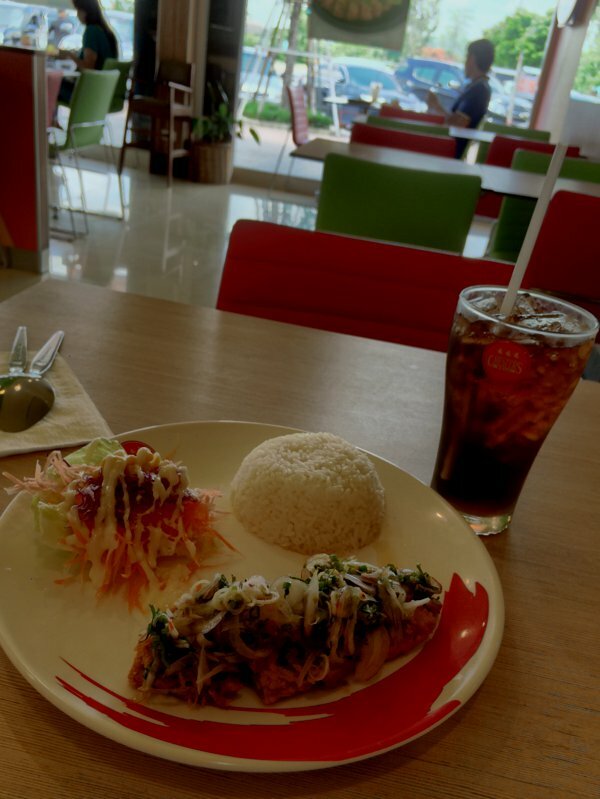 Actually, I needed the air-conditioning in the restaurant more than the food itself. 83km to Mae Sot. This is when it became overwhelming. Admittedly, I did not sufficiently research Mae Sot. 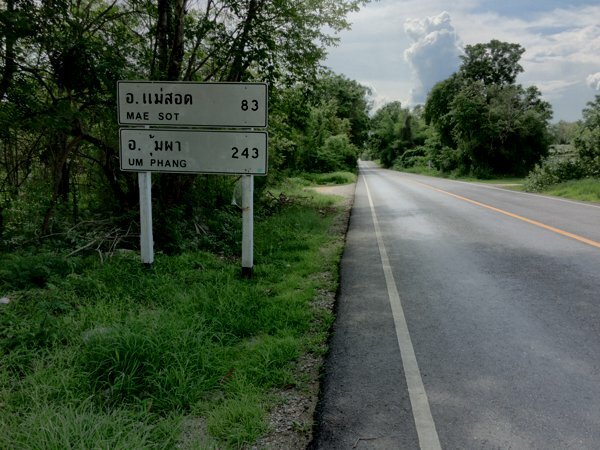 All I knew is that it is a border town of Thailand where it meets Myawaddy in Myanmar. 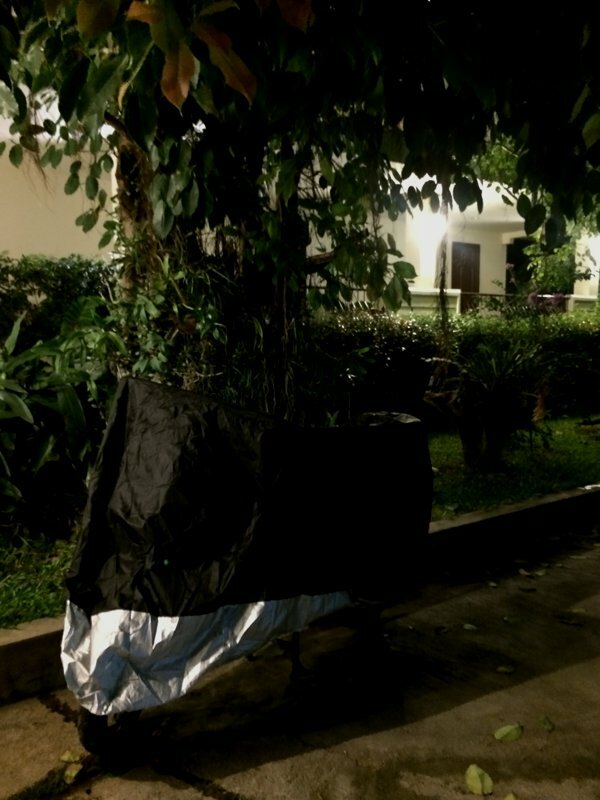 Although I had no intentions of crossing to Myawaddy, I thought I’d just spend a night here and check out the place. 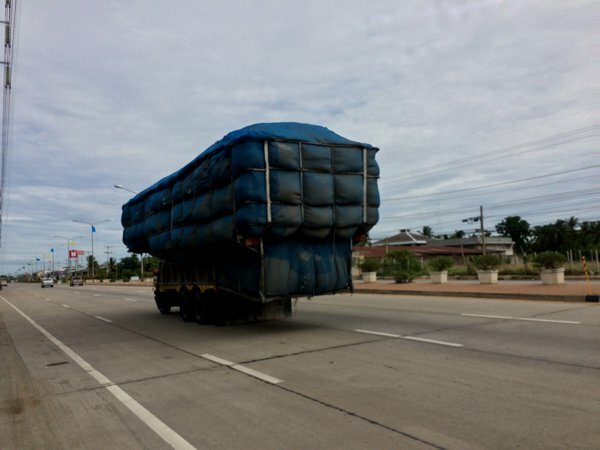 At approximately 80km to Mae Sot, this is when things started turning… well… interesting. First, I was running low on fuel. The reserve light had come for awhile now. The previous gas station I pulled into had either run out of fuel or that their pumps weren’t working. Either way, the pump attendant signaled the universal “no fuel” sign with her 2 hands crossed and shaking her head side to side vigorously. I tried asking her how far the next pump station was while pointing towards Mae Sot. 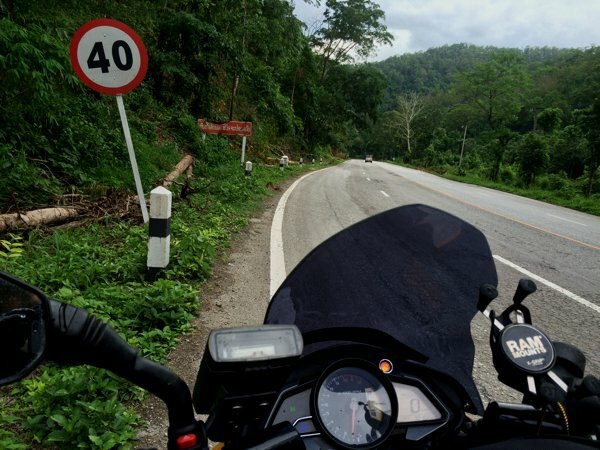 Well, my sign language seem to be working, and she nodded her head and said, “Mae Sot.” Well, with 80km to go and 2bars of fuel left on my digital fuel gauge, I estimated that I should have slightly below 3 liter of fuel, and with an average mileage of, say, 30-35km/l (if I’m not pushing it), I figured that I should be able to reach Mae Sot safely. 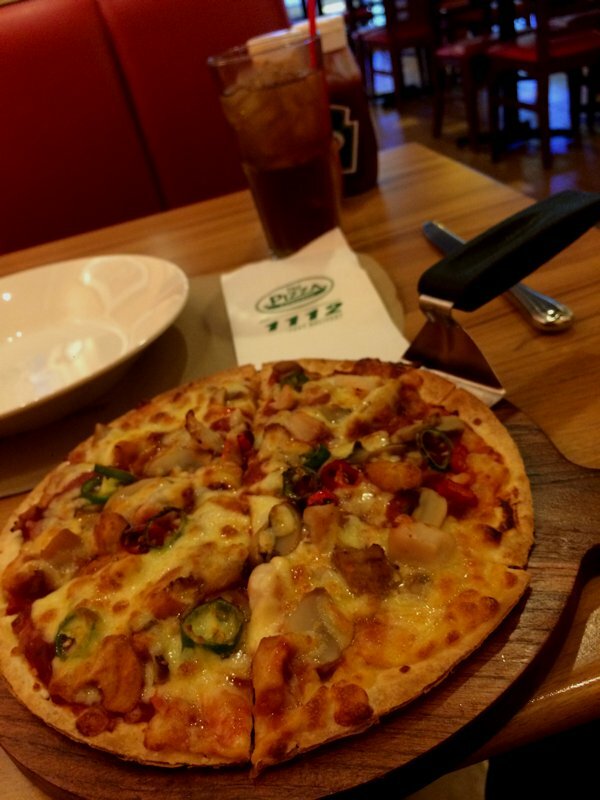 And then, the fun began…. Weee! Playground! That’s the motorcyclist’s version of the children’s play slide. 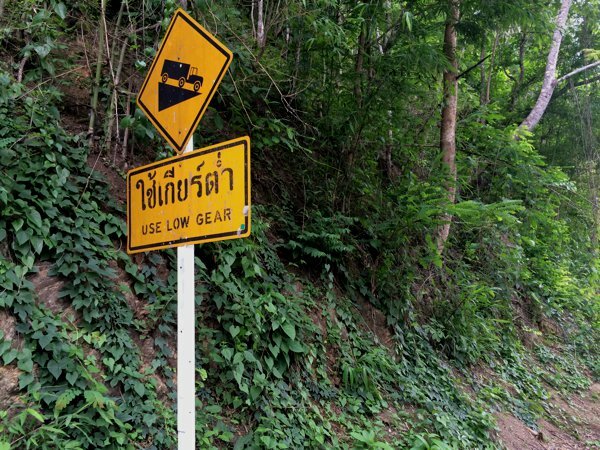 Steep ascents and descents. Notice the fuel level and the fuel reserve light there? I really wasn’t prepared for this. 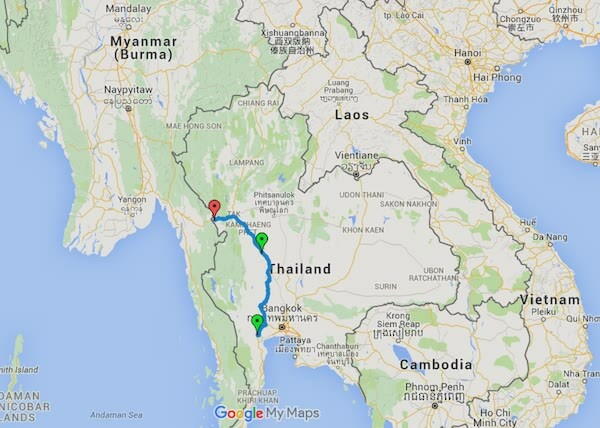 As you can probably guess by now, the route to Mae Sot is a mountainous pass. First, I didn’t expect this at all. And being the newbie rider that I am (remember, I’ve only started riding in Jan this year), this was my first mountain-pass-twisty and I was naturally nervous – keeping a death grip on my handlebar. Next, it started raining. No. Pouring. And because thinking that I was about to reach Mae Sot soon, I figured I’ll just soak it up and then wash up when I get to the hotel. Perhaps it was the nerves. But perhaps also due to my wet jacket, pants and especially gloves. I was shivering. I was feeling cold. 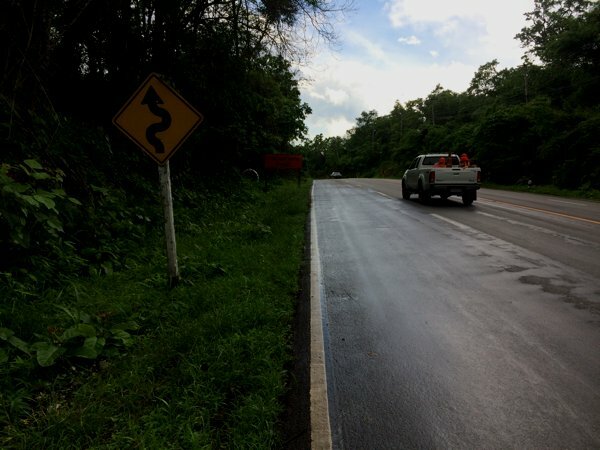 The mountainous twisty roads leading to Mae Sot. Perhaps it wasn’t my noob nerves or the rain. 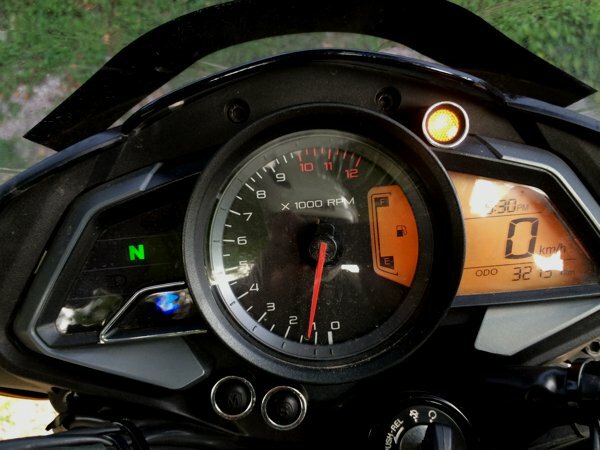 Maybe it’s me knowing for a fact that the bike’s gonna be gulping alot more fuel than usual in elevated altitudes (I’ve got a carbureted bike), and the low gear steep climbs. 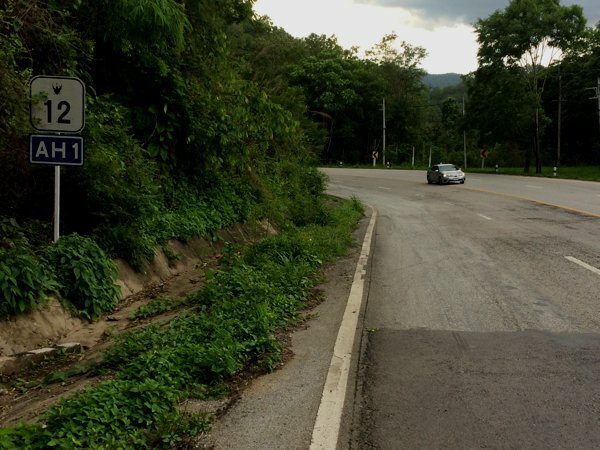 What if I miscalculated, and ended up running out of fuel before I reached Mae Sot? Cold, wet, and somewhat miserably worrying about the low fuel situation, I honestly didn’t enjoy this mountainous twisty as much as I should. I’m conscious of keeping the bike rev’ed in the power band while negotiating the turns, but I was also in super fuel conserving mode. The next 80km of the journey was a mix of cold and worrying. And because it was raining, I didn’t have too many picture taking opportunities. Is that fuel usage precision or what! Empty when I reached Mae Sot. Ah! Finally! Thankfully I reached Mae Sot before I ran out of fuel! Phew! Should have refueled much much earlier. So after dinner, I went to the petrol station. Guess how much of that 12L capacity tank I had to fill up? 11.6L. Which means I only had 0.4L of fuel remaining – 0.2L of which is likely unusable. Lesson learnt. Always refuel when tank is about half. I headed to the nearby Tesco Extra to get more Thai Baht with my USD notes I was carrying. Had dinner there. Decided to give myself a little treat for having come this far. Hotel private parking. Goodnight lil’ one!